Leonard Williams had his first encounter with a woolly monkey at a zoo and it left a deep and lasting impression on him. Some years later, in the midst of a busy life as a musician running a London guitar school, he was bequeathed a woolly monkey in a will. He started to keep them as pets but soon realised that the key to their welfare was to allow them space and freedom to develop their natural, social behaviours. He watched and related to them with sensitivity and respect, learned their complex language and treated each one as an individual. 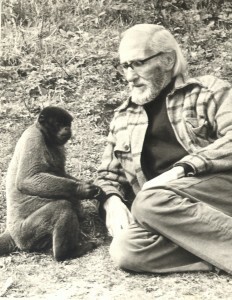 By 1964 the needs of the colony had grown and Len abandoned London for the Cornish countryside, purchasing Murrayton House and building enclosures for the monkeys. He began to appeal to pet owners and zoos to give their monkeys to the Sanctuary in order to give them the chance of a more fulfilled life and, from that point, many ex-pet and zoo monkeys joined the group. Lulu was one of the original woolly monkeys rescued by Len and was unusual in that she had been taken from the wild at about four years old, so she knew something of life in a group in the wild. She was able to pass on vital social skills to the other monkeys and through her determined character she soon became the matriarch of the group. In 1966 she gave birth to the very first infant, Charlie, and knew how to care for him properly due to her time in the rainforest. The Monkey Sanctuary was the first place in the world where woolly monkeys bred successfully in captivity. Over the next 20 years the Sanctuary expanded. The monkeys’ territory grew in size to meet their need for space, privacy and variety; the team of carers increased and the monkeys enjoyed excellent health and fitness due to improved knowledge of their healthcare needs. Len Williams passed away in 1987 and Lulu, by this time a great-grandmother, died the same year, at the grand old age of 32.